(AFP) - United States sanctions aimed at pressuring Nicolas Maduro to capitulate in his power struggle with self-proclaimed acting-president Juan Guaido have Venezuelans fearing they may be left facing fuel shortages. Whether they support the US sanctions or not, Venezuelans interviewed by AFP agreed on one thing: with a devastated economy, hyperinflation the International Monetary Fund predicts will reach 10 million percent in 2019 and shortages of food and medicines, this will only make things worse. The US imposed sanctions on Venezuela's state oil company PDVSA on Monday in an attempt to cut off a vital source of funds propping up Maduro's government. Proceeds from the purchase of Venezuelan oil will now be withheld from Maduro, a heavy blow given that more than 40 percent of the South American country's crude is sold to the US. And while Irene Mendez fears it will become impossible to buy petrol in the coming weeks, she says it will be worth it. "It will be really strange," she said. "We're used to petrol being really cheap and, on top of that, it's available." For Jorge Moncada, another truck driver, the sanctions are an economic "checkmate." He says there are "already places where you can spend up to 24 hours" waiting in line for fuel. Despite the constant tensions between Washington and Caracas since the socialist regime of Hugo Chaves came to power 20 years ago, the US has remained Venezuela's biggest single oil client. 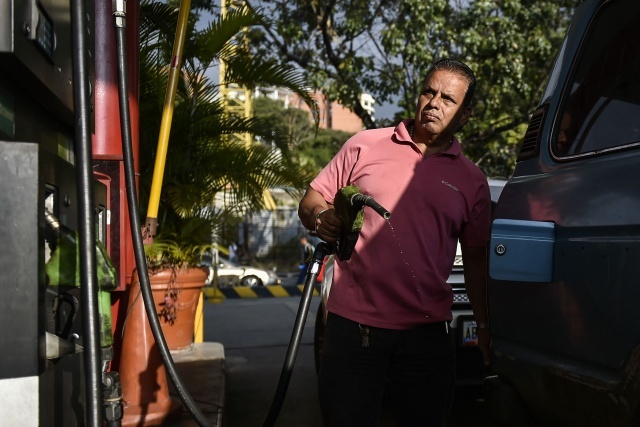 But with the US demanding Maduro relinquish power in order to lift the sanctions, "if there isn't a political change soon, we'll have serious fuel problems," said analyst Asdrubal Oliveros from the Ecoanalitica consultancy. US purchases actually account for 80 percent of Venezuela's liquidity, according to Ecoanalitica, since exports to allies Russia and China are principally used to pay off debts.